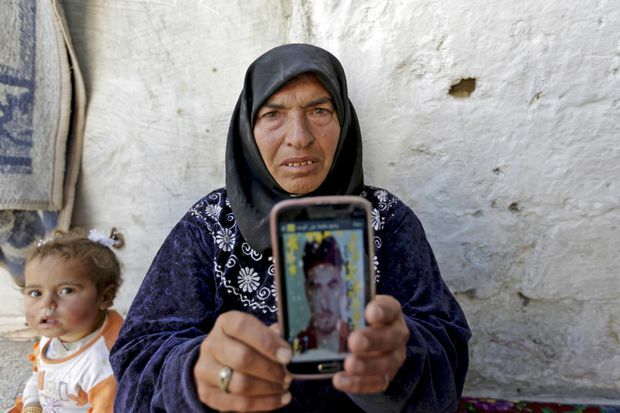 Amal Ibrahim, 57, shows a picture of one of her sons, Mohammad, as she poses in the rebel-held Kafrouma village in the southern countryside of Idlib, Syria, March 20, 2016. Her two sons were detained by authorities in the northern Syrian province of Idlib. She says she was told that one of them, Abdullah, died from torture after he was detained in Maaret al-Numan. She has not heard any news about her other son, Mohammad, who was detained in Khan Sheikhoun. Mother's Day in Syria is celebrated on March 21.